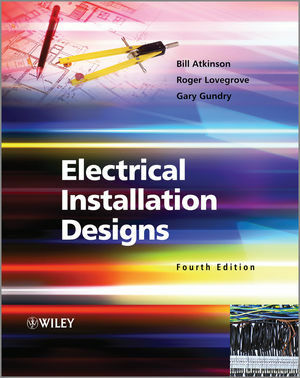 The book is a clearly written practical guide on how to design and complete a range of electrical installation projects in a competitive manner, while ensuring full compliance with the new Wiring Regulations (updated late 2008). The updated regulations introduced changes in terminology, such as ‘basic’ and ‘fault protection’, and also changed the regulation numbers. This new edition reflects these changes. It discusses new sections covering domestic, commercial, industrial and agricultural projects, including material on marinas, caravan sites, and small scale floodlighting. This book provides guidance on certification and test methods, with full attention given to electrical safety requirements. Other brand new sections cover protective measures, additional protection by means of RCDs, the new cable guidelines for thin wall partitions and Part P of the Building Regulations. Mr. Bill Atkinson (deceased) Bill Atkinson was the writer's pseudonym used by Alan Smith, the original author of the book. He worked in the electrical installation industry and at the NICEIC. Mr. Roger Lovegrove, Consultant, Surrey, UK Roger Lovegrove is an electrical consultant. He is a member of the Electrical Contractors' Association techinical committees and of the joint IEE/BSI Wiring Regulations committee. With his vast knowledge in this area of electrical engineering, he has updated Bill Atkinson’s original text for this fourth edtition. Mr. Gary Gundry, Senior Engineer, Electrical Safety Council, UK Mr Gundry worked for Seeboard and Eastern Electricity, before becoming a lecturer at Lowestoft College, teaching electrical contracting and electrical engineering up to HNC level. He joined NICEIC in 1999 after spending three years as a Director and Qualified Supervisor of a business enrolled as an Approved Contractor, where he worked in the Standards division on the NICEIC Technical Manual. He is now Senior Engineer at Electrical Safety Council. Mr. Martyn Allen, Senior Engineer, Electrical Safety Council Martyn Allen's experience in the electrical installation industry spans 30 years. He served an apprenticeship and worked as an electrician with British Coal, spent 16 years in engineering insurance risk management and then joined the Electrical Safety Council. He is a Chartered Electrical Engineer and Corporate Member of the IET. He is a member of the Joint Technical Committee JPEL/64 Panel C – Shock Protection and Isolation and Switching.